Well, it was an interesting night this evening. I showed two fun homes. The second not as good as the first. Both ranch and great yards. The second one had a massive master bedroom of 19 X 15. Very cute but needed too much work for the price. It was also somewhat taste specific. Whomever had owned this estate liked wood. The bathroom looked like something you would find in a log cabin. Really it was nice and not too bad. The kitchen was updated at some point (maybe the 70’s to 80’s) and additions made to the home. There was really a lot of wood accents in this place. I had to run and get my camera out of the car (I always try to keep one handy). 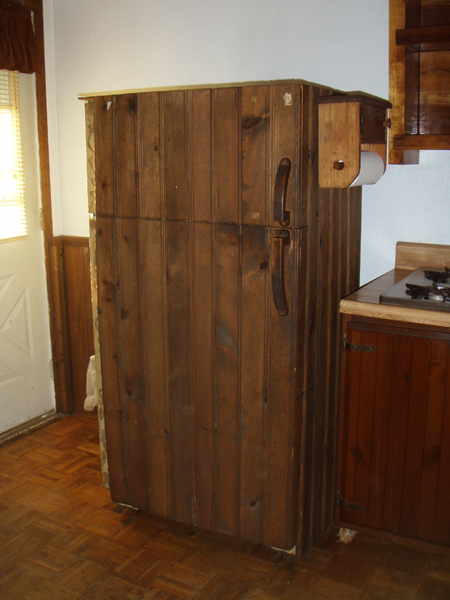 Ok, so have you ever seen someone cover their refrigerator with wood to match the kitchen. Well there is a first for everything. So funny. . . . . I guess you could called it a remodeled refrigerator. LOL . . .
First time home buyers get ready. One month from Tuesday is approximately how much time you have left to secure your sales contract on the purchase of a house, if you are going to qualify for the tax credit. It takes about 6-8 weeks to process a sale (as long as things go fairly smooth). Here is some additional information about the exisiting rates. It is still a buyers market with plenty of inventory to choose from. Take advantage! “Long-term mortgage rates remain near record lows, despite rising slightly this week. Freddie Mac reported that average interest on a 30-year fixed loan was 5.14 percent, up from 5.12 percent a week ago. Rates for 15-year home loans, meanwhile, rose to 4.58 percent from 4.56 percent last week. I receive many calls and meet with many eager buyers who would like to buy foreclosures or bank owned properties. In most cases, these properties are in bad shape. If you get lucky, you can sometimes find a property in somewhat good condition. First time home buyers want do get a super deal. The problem that many buyers run into is, they are not always aware of all the obstacles with these type of properties. One obstacle is getting past the required financing repairs. Most first time home buyers use FHA financing. FHA has strict rules on conditions of the property. With a regular FHA program, ALL conditions must be fixed prior to closing. So who is going to fix the property if it needs say $10,000 to 15,000 in repairs. Most bank properties are sold “AS IS” so that means it is up to the buyer to make the repairs. Ok so if the buyer has FHA financing then the buyer is going to have to make the repairs to the house prior to closing. So, as a buyer, do you want to be sinking several thousand into a home that you don’t own, knowing that ownership is not secured until closing?? Some banks will not even permit repairs on the property prior to closing. What ends up happening is in many cases is cash buyers come in with no mortgage requirements wanting no inspections and rehab it to resell or rent. The good news is, if you are up for the challenge, I have been made aware of some lenders out there that offer what is called a FHA/203K loan. These have been around for years but it was hard to find a lender that would write up a loan like this, especially in recent years. It is a neat process and one of my buyers is currently running on this program. The FHA appraiser goes in and finds out the condition of the property and reports what needs to be done. Then after or at the same time the FHA approved contractor goes in and estimates the cost of the needed repairs. Next the bank loans the buyer the repair money (above the price of the house) as part of their mortgage amount. At closing an escrow account is set up to hold the repair money. At that time, the approved/certified FHA contractor (not Uncle Joe) is paid part of the funds for the repairs and then when completed and approved, they are paid the balance. So if you are looking at these type of properties and are going with FHA financing, you may want to find a lender that will approve your for an FHA/203K loan and don’t expect to move in right after closing depending on the nature of the repairs. I think this program is exciting for the right buyer who is up for the challenge. In the last few weeks, I have had some buyers that have not moved quickly and unfortunately lost opportunity for the home of their first choice.Â The good one’s are going and going fast.Â Many are getting multiple offers.Â This describes many average priced properties and but even more so to foreclosed properties. One of my buyers called and said that they went back to review some of their favorite listings and many of them had the status changed to under contract.Â Â Time is running out for the first time home buyer tax credit and so is the good inventory. Here is some additional information quoted from Realtor.org regarding foreclosures and that they are disappearing. “Buyers of foreclosure have to be quick these days. Some houses go under contract fewer than 90 minutes after they are put on the market, says Brad Geisen, founder of Foreclosure.com. “For every listing that comes out, we have 10 buyers,” says Cesar Dias, an associate with Approved Real Estate Group in Stockton, Calif.
“We had a lot of inventory last summer. Now we’re down to 1,500 listings â€” from more than 5,000,” Dias says. Even in the hard-hit Detroit area, bargains are disappearing. When selling your home, it is not required that you be at the home for your buyer’s appraisal. When I sold my last home many years ago before I was an agent, I was there. I made sure the appraiser knew how much I paid for my home, and how much I put into it. I had a large list of all the upgrades and maintenance items that I had done and how much I paid for everything. I also made sure the appraiser knew all the features of the home. I had even prepared some home comparables from the neighborhood (even though I knew the appraiser had access to the data). I even had the house immaculate as if I was showing it to the buyer. I think everything helps. Appraisals can be tricky these days. Hereâ€™s some advice from Maureen Sweeney, a Chicago-area owner of an appraisal firm, on getting an accurate and fair appraisal. * Both the real estate practitioner and the owner should be present for the appraisal and follow the appraiser around. Make sure he doesnâ€™t miss anything important. * Ask questions to determine if the appraiser has identified the correct neighborhood boundaries and if sheâ€™s comparing the home to similar properties. * Bring a copy of a recent tax bill and a survey of the property, and give them to the appraiser. * Provide a list of improvements to the home. With all the super deals, increased home inventory, low interest rates, and the tax credit it is no wonder that the housing market statistics picked up in June.Â This is encouraging news for the market and the economy.Â Remember approximately two months left to get a home under contract to take advantage of the tax credit. ” Sales of newly built single-family homes rose 11 percent in June to an annualized rate of 384,000, according to a report released Monday by the U.S. Department of Housing and Urban Development. “The time for getting deals is going away.” Markstein said.